Anxiety overload! Friday I went to see Risa for my first ultrasound to check for the baby's heartbeat. I may have given myself an ulser with all the craziness I put myself through (of course I'm kidding, but my stress levels were scary). Stomach pain trumped my nausea this week which meant that I only puked once or twice (good), but I was on the toilet the rest of the week with "other" stomach problems (bad, really bad). I was so tired I could barely keep my eyes open, but the stress I was experiencing wouldn't let me nod off to sleep. I couldn't breathe! My heart was racing (Risa says it was a combination of my body producing twice as much blood, hence my heart pumping even harder, and my anxiety...a bad combo!). Unfortunately, apparently, it's kinda normal. Friday came along and everything was fine!!! The relief was immediate. Walking out of Risa's office I could breathe! And then a deep exhaustion fell over me. I slept for 3 hours that afternoon (not like me). 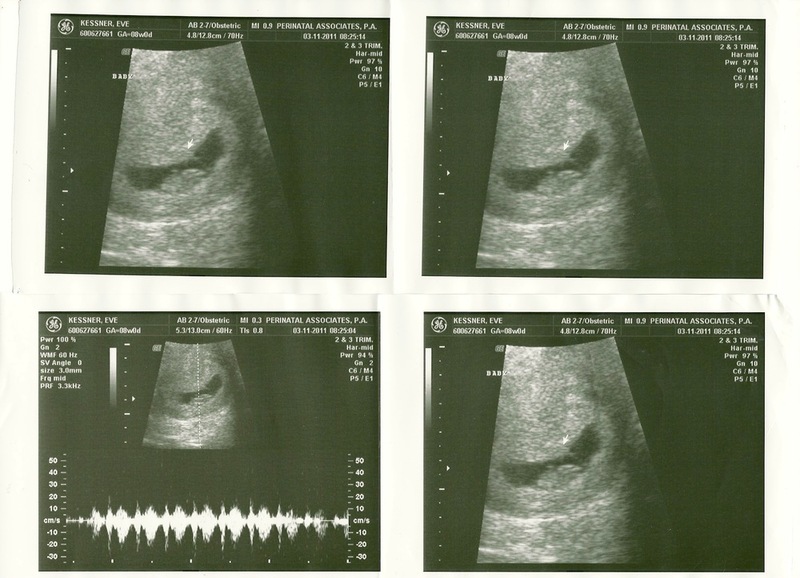 Here's what I found out: my chance of miscarriage dropped to 8% (that made me feel good). The baby had a healthy heartbeat and there was only one in there! 9 Weeks Pregnant and Counting..